My grandfather always told me if I hung on to old clothes long enough, they’d eventually come back in style. And generally, this fashion phenomenon is harmless: wide neckties give way to thin ties which are replaced by wide ties. However, after being exposed to one man’s gym attire yesterday, I’m here to sound the alarm about the return to short shorts. 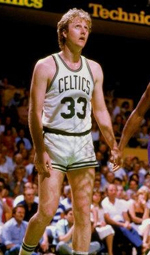 Short shorts used to be the preferred look in the NBA. Not only are these bottoms ridiculous in their own right, they also become particularly unappealing when mixed with the stretching and straining of a gym workout. Let me be clear: My concern here has nothing to do with sexual orientation or embonpoint. Short shorts are an eyesore, and simply not a good look for a dude. Let’s hope this is just a one-man trend. This entry was posted on Saturday, May 19th, 2007 at 12:53 pm and is filed under All Time Nuttiest. You can follow any responses to this entry through the RSS 2.0 feed. Both comments and pings are currently closed. I agree with you 100%. I think, however, that your short-short wearing guy might be the required “one guy” like the one guy in every other gym across America wearing shorts that are way too short.